Wesley-Knox United Church traces its roots back to 1853 when members of the sparsely settled community of New Brighton—now South London—began meeting in a schoolroom on the south side of Askin Street just east of Wharncliffe Road. In 1874, members of this small congregation requested a full-time minister, purchased a lot at the corner of Askin and Teresa streets and built a small frame structure that became New Brighton Methodist Church. As the congregation grew, there was need for a larger worship space. In 1881, the congregation opened the present building, naming it Askin Street Methodist Church. The older structure became the church’s Sunday School. In 1908, the church’s sanctuary was expanded with the addition of the present chancel area. In the style of the day, the room behind the new Casavant organ became the Sunday School. In 1918, the steeple, struck by lightning and partly burnt, was removed. A parlour and gymnasium were added in 1924. In 1925, when Methodists, Congregationalists, and 70% of the Presbyterians joined to form the new United Church of Canada, the church was renamed Wesley United Church. In 1883, Presbyterians in the area purchased a lot at the corner of Wortley Road and Bruce Street. Knox Presbyterian Church was dedicated the following year. In 1925 a majority of that congregation voted to join the new United Church of Canada and their church became Knox United Church. 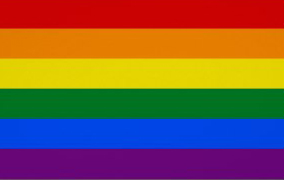 (Those who chose not to join formed Elmwood Avenue Presbyterian Church.) 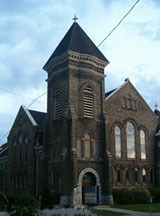 In 1972, Knox United amalgamated with Wesley United to form Wesley-Knox, and the Knox building became St. Stephen of Hungary Roman Catholic Church. When the Knox building was demolished, the St. Stephen congregation offered the remaining Knox stained-glass windows to Wesley-Knox. These now grace the Wesley-Knox sanctuary and narthex area. In 1875, Methodists in East London began meeting at Salter’s Grove, now Queen’s Park, part of the Western Fair District. 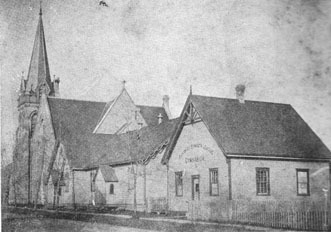 In 1892, the congregation, then known as Queen’s Park Methodist Church, dedicated its new building on the north side of Dundas Street just west of Ontario Street. To mark the 100th anniversary of the death of John Wesley, it was named Centennial Methodist Church. In 1925, it became Centennial United Church. In 2005, members of Wesley-Knox and Centennial began discussions and the two churches amalgamated in February 2006. Stained-glass windows from Centennial now grace the Wesley-Knox chapel and back of the Wesley-Knox sanctuary. The Centennial name lives on in the Centennial Parlour. Although there was no formal amalgamation, many members of the former Westminster United Church also chose to make Wesley-Knox their church home. Wesley, Knox, Centennial and Westminster—all have added to the energy, generosity of spirit and richness that now comprises Wesley-Knox. In 1882, Jack Addie and Joe Ludgate, who met at an evening worship service in the new Askin Street Methodist Church, now Wesley-Knox, organized the first Salvation Army corps in Canada. Jack and Joe are depicted in a stained glass window on the southwest corner of the sanctuary, preaching outside the original Covent Garden Market on King Street, downtown London. 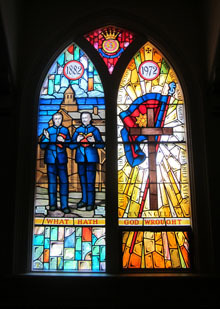 This window, the 1972 gift of the Salvation Army to Wesley-Knox, commemorates the 90th Anniversary of the Salvation Army in Canada.